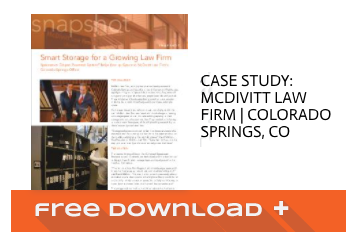 Watch the video to learn how McDivitt Law Office used Spacesaver mobile shelving to make room for more people, or download the case study below! A law firm filing system can not only help your team stay organized and efficient by keeping case files close at hand, but they can assist in freeing up space for more people. Point-of-use storage or custom cabinets can keep all of your important case files and documents right at your workstation for quick access. 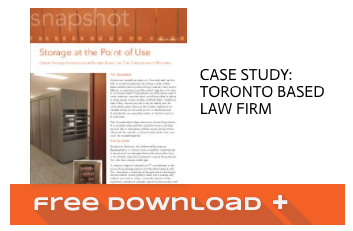 Learn how a Toronto-based law firm used point-of-use solutions in their form by downloading the case study. 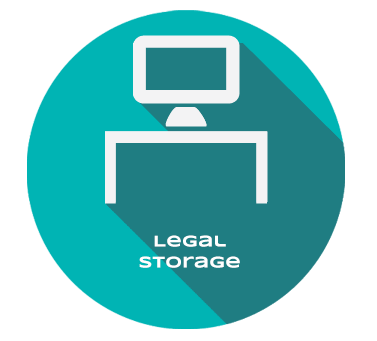 For a centralized law firm filing system, customized mobile storage units help increase capacity, or free up wasted space.